Syrian FM Muallem says US must withdraw from southern Syria before negotiations can advance. Syria's foreign minister on Saturday linked any talks on the future of a rebel-held southern region with the departure of US forces from another area bordering Iraq and Jordan. Regime ally Russia has called for a meeting with the United States and Jordan on the future of the southern provinces of Daraa and Quneitra, bordering Jordan and Israel's Golan Heights. In recent weeks, Damascus has sent military reinforcements to the two provinces, which comprise some of the closest rebel-held areas to the capital. Russian President Vladimir Putin has spoken with Israeli Prime Minister Binyamin Netanyahu about proposed talks. The two agreed on a gradual withdrawal of all non-Syrian forces from the area bordering Israel. 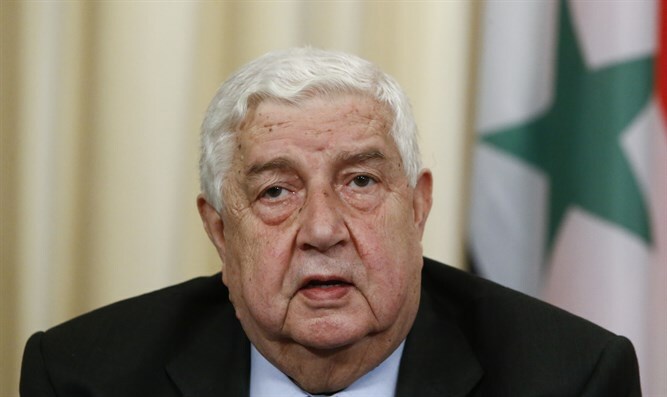 "We have not yet entered into negotiations over the southern front," Syria's Foreign Minister Walid Muallem said at a press conference in Damascus. "The indicator will be the withdrawal of the United States from our land in At-Tanaf" near the Iraqi and Jordanian borders, Muallem said. The United States and its allies have used a base in the area to train a force fighting the Islamic State (ISIS) terror group. "Don't believe anything that is said about an agreement on the south until you see that the United States has withdrawn its forces from the At-Tanaf base," he said. "It must withdraw its forces from At-Tanaf." "We have striven from the start to resolve the issue in the ways that we are used to, which are reconciliations," he said. "If it is not feasible, we will see what will happen." Moscow-brokered reconciliation deals have seen rebels withdraw from several areas of Syria, including opposition strongholds close to the capital, often after blistering regime offensives and sieges. Last month, Washington warned Damascus it would take "firm" action if the regime violated a ceasefire deal for southern Syria that was negotiated with Russia and Jordan last year. The warning came after regime aircraft dropped leaflets on Daraa, urging the rebels who control most of the province to lay down their weapons or face an offensive. The United States is also present in the north of Syria, where it has been backing a Kurdish-led alliance fighting ISIS. Muallem also criticized a US-Turkish roadmap for "security and stability" in the Kurdish-held city of Manbij near the Turkish border. The agreement came after forces led by Turkey, who considers Syria's Kurdish militia to be "terrorists," in March seized the enclave of Afrin west of Manbij. That had raised fears of a confrontation between Turkish troops and American forces based in Manbij. "Not just in Manbij but also in Afrin and on every inch of Syrian soil, we consider Turkey to be an aggressor," the foreign minister said. "Neither the United States nor Turkey has the right to negotiate over a Syrian city," he said, describing any such deal as "infringing on Syrian sovereignty."